Our banded greaves have a great look to them. You can get them in a solid color or in contrasting colors. These greaves are designed to fit men and women. 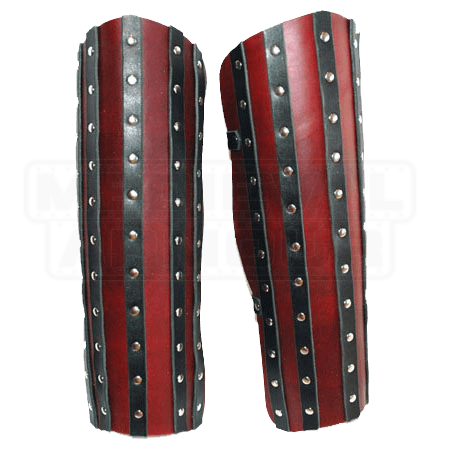 The standard greave measures 17 inches long and will either be below or over your knee depending on your height, with either situation still providing a comfortable fit. 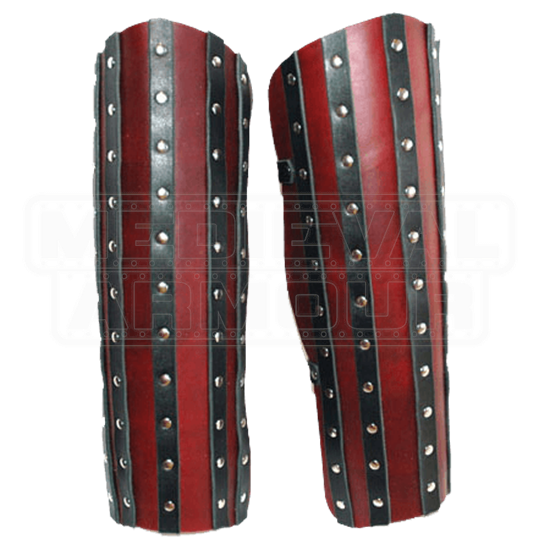 Our banded greaves are made of 7/8 ounce leather with 5 bands of leather on top, creating a very unique look. Matching body armor and arm bracers are also available separately. The greaves are shown in Red with Black bands. When selecting your colors, the Color selection is for the base of the greaves (shown in red). The Accent Color selection is for the bands (shown in black).